Emergency crews were called to the scene of an Ultra Light aircraft crash on Wednesday afternoon near Racine. RACINE — A small Lazair Ultra-Light Aircraft crashed on Wednesday afternoon in the area of Bashan Road and Tornado Road in Racine sending two people to the hospital via medical helicopter. According to a news release from the Ohio State Highway Patrol Gallipolis Post, the aircraft was piloted by Beau Diddle, 27, of Racine, with passenger Bryce Bowling, 29 of Pomeroy. Both men sustained incapacitating injuries and were flown to Cabell Huntington Hospital. 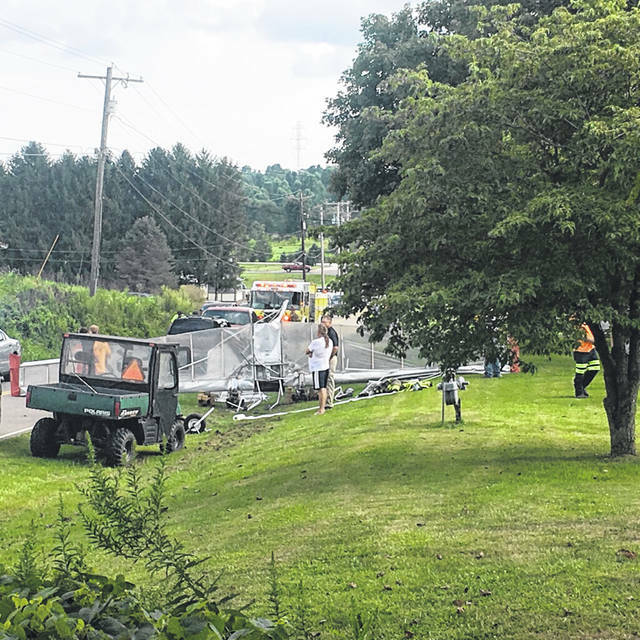 The ultra-light glider was flying north bound when it reportedly lost power and crashed into a yard along Bashan Road. Ohio State Highway Patrol, Meigs County Sheriff’s Office, Racine Volunteer Fire Department, Meigs EMS, Federal Aviation Association, Meigs EMA and other first responders were on the scene Wednesday afternoon. Two medical helicopters were also at the scene. According to a release, the roadway was closed for two hours as a result of the crash. https://www.mydailyregister.com/wp-content/uploads/sites/24/2018/08/web1_8.16-crash_ne2018815182511819-1.jpgEmergency crews were called to the scene of an Ultra Light aircraft crash on Wednesday afternoon near Racine.